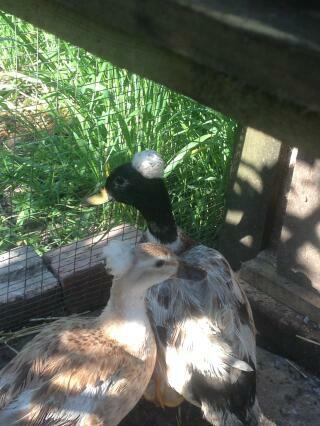 The aim of producing this breed was to introduce a replica of the large Crested duck. It is a recent introduction which was first bred by Roy Sutcliffe in Yorkshire in the 1980s. As with all crested ducks, the challenge of producing the perfectly formed and sited crest continues to attract interest. In 1992 the first pair were sold at the rare Breed Survival Trust Show and Sale for over £100 and they were standardised in 1997. It makes a lovely exhibition bird with its dainty body and stunning plumage. The crest is not just feathers but is a small mass of fatty tissue with feathers growing out of it. It should be round and prominent but its important that it sits up on the centre of the head and not over the eyes with tight feathering not loose trailing feathers. It's not the easiest of breeders so getting the position and type of crest as well requires a skilful breeder. Despite its prettiness it is a very active bird that loves to look for food. If the crest is too big you may need to trim the feathers to keep it clean but of course if exhibiting like this is not permissible. It can lay up to 100 eggs a year as well so useful as well as beautiful. Give it a clean area with plenty to do where it can keep its lovely plumage and crest in good order. 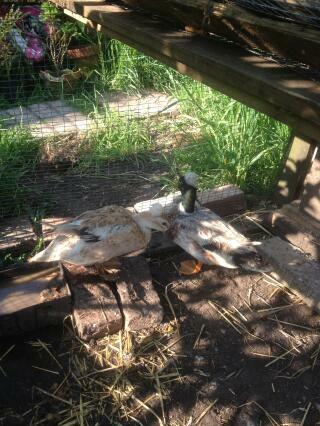 Drakes will damage the crest of the ducks when mating; as with any duck breed, keep very low ratio of males to ducks. One drake is sufficient per breeding pen of two or three ducks. The Crested Miniature is classified as a bantam duck and comes in any colour as long as the marking are symmetrical. It is important that in the white variety the legs and feet should be orange with the bill being orange/yellow which is very eye catching against a white body.